We at WAttention adore sweet treats and we also enjoy cooking. So when we heard about The Providore Cooking Studio’s cooking classes, we decided to drop by one morning to learn how to bake a Strawberry Swiss Roll to feed our curiosity (and love for sweets). To kick things off, Chef Mayumi Taneie (or Mayumi-sensei as we called her) gave us our recipes and laid out the ingredients we would need. Our ingredients were measured out and prepared before hand, making it easy to get started right away. As she went through the ingredients, Mayumi-sensei explained why she chose certain ones over others. She didn’t hesitate to share her knowledge and baking know-how with the class at all and patiently answered all our questions whenever we had one. She began explaining and leading us through the entire baking process before letting us have a go on our own. Initially when we looked at the recipe we thought it was simple enough (there were barely 10 steps) but we were so wrong! As the saying goes, the devil’s in the details. From preparing the ingredients to fluffing the batter, Mayumi sensei had a tip for everything – including seemingly simple things such as using a swirl motion to spread the batter (so that you “don’t kill the foam”) to insightful tips such as fluffing eggs till they looked like facial foam (“small foam bubbles are better than large ones”, says Mayumi-sensei). You might feel a little overwhelmed by the amount of information she shares but it’s a good idea to take as many notes as you can as the recipe she prints out is rather bare bones. It’s in her spoken teachings that you’ll find the information you need. After she was done with her batter, she put her cake in the oven to bake and we got started on our own cakes. As we fluffed our eggs to make our meringue or beat our batter, Mayumi-sensei kept a careful eye on us and helped us along the way; constantly reminding us to not over-beat the meringue. Our take away for the lesson? Do not kill the foam! 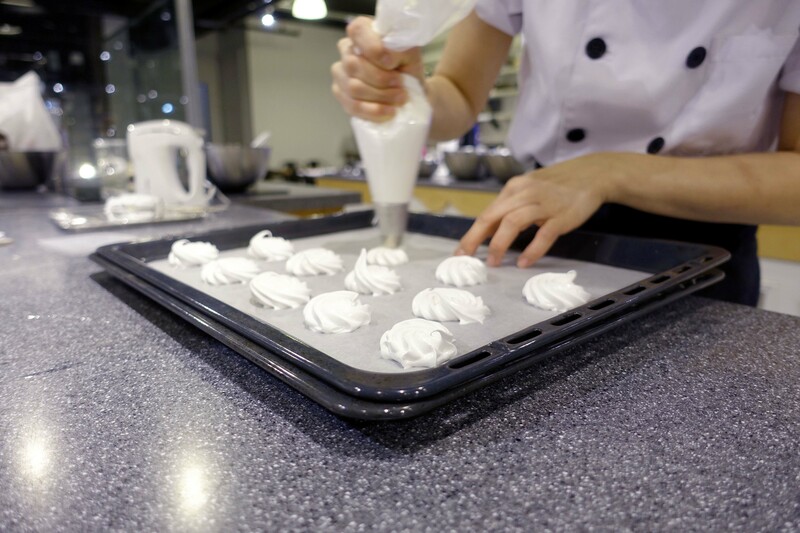 Keeping the meringue and batter airy is what gives it it soft and chewy texutre. We even learned how to make our own strawberry jam for the filling! 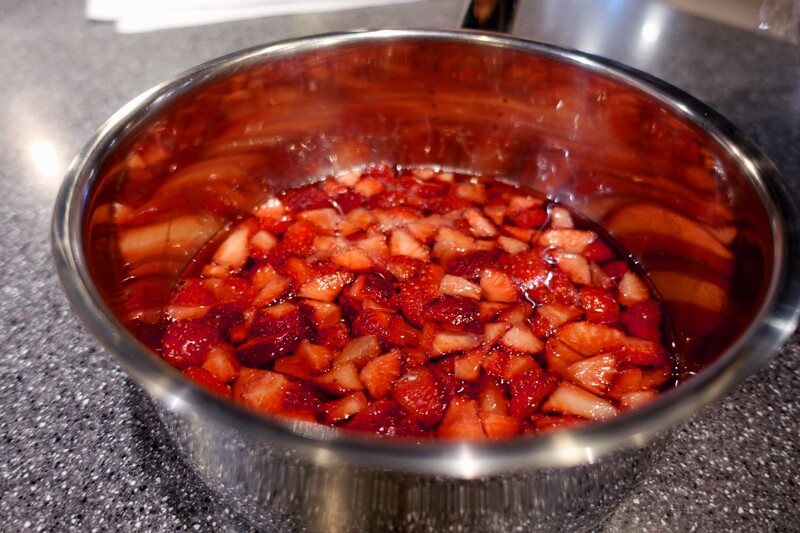 For this recipe we used Tochigi’s famous Tochiotome strawberries which are in season around December and January. Mayumi-sensei explained that Japanese strawberries are her choice ingredient as they have a subtly sweet flavour and aren’t so tart. But if you choose to use American or Australian strawberries she advises that you toss them in sugar before using them in the jam to bring out the fruits’ sweetness. After about 13 minutes, Mayumi-sensei took her cake out of the oven and it smelt heavenly. Mayumi-sensei let her cake sit while she put ours in the oven. She then showed us how to properly spread our mascarpone and strawberry cream evenly over the cake before sprinkling diced fresh strawberries and rolling it up. After that, we did our own cakes and Mayumi-sensei placed them in fridge before moving on to the next recipe; Eton Mess. An Eton Mess is an English dessert traditionally served at Eton College. It’s made with pieces of meringue, cream and strawberry (occasionally even served with ice cream like it was that day). 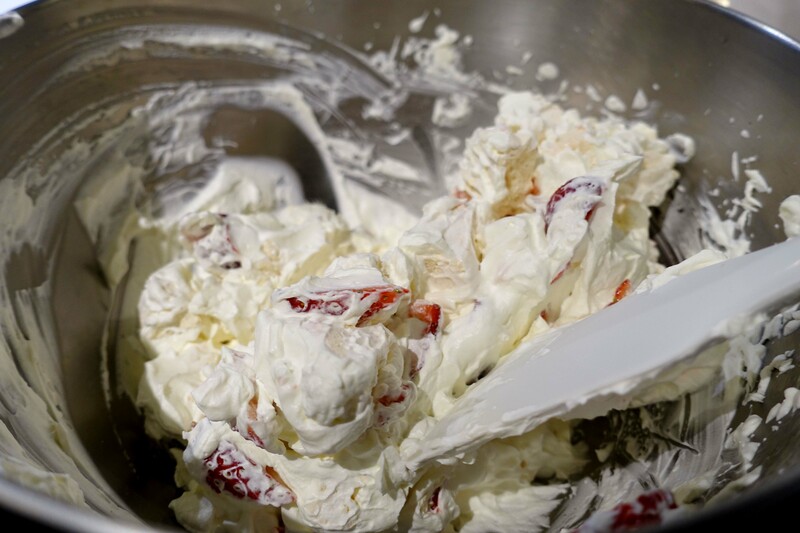 Compared to the Strawberry Swiss Roll, the Eton Mess was definitely easier to make, using the same skills for meringue making as the swiss roll. All you had to do was bake and break the meringue before mixing it with cream and strawberries and serving it. As Mayumi-sensei put together the Eton Mess, she sliced and served up her Strawberry Swiss Roll and brewed up a pot of hot tea for her students to enjoy. The cake was so good. The sponge cake was soft and moist while the cookie dough dotted exterior added a crumbly texture. The cream was smooth and the strawberries were fresh and sweet. Like all Japanese sweets, the cake definitely leaned on the sweeter side of things but it was delicious nonetheless. The Eton Mess as a rich, creamy dessert was surprisingly refreshing, thanks to the strawberries and raspberry coulis. It is quite heavy though, but would make a simple treat to prepare a day before you need to serve it. You’ll find almost everything you need to create your own baked goodies at the store next to the cooking studio (otherwise just head to The Providore’s market round the corner). The Providore’s Cooking Studio conveniently carries all the ingredients you will need to bake the day’s recipe in your own home, including seasonal ingredients such as the Tochiotome strawberries that we used. 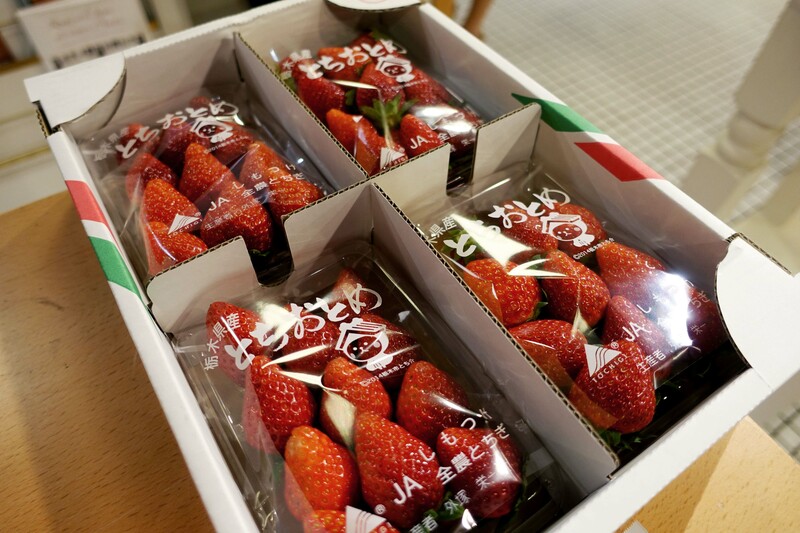 Tochiotome strawberries hail from the Tochigi Prefecture. Known as the “Strawberry Kingdom”, Tochigi is famous for their strawberries due to their extensive studies and cultivation research. Tochiotome strawberries have a large size, bright colour, delicate scent and lingering sweetness without the usually tartness found in other breeds of strawberries. Apart from the strawberries, Mayumi-sensei also uses other Japanese ingredients such as Okinawan brown sugar and bread flour as Okinawan brown sugar has a better flavour and bread flour creates a fluffier texture for the cake. On the shelves just next to the baking studio you’ll find tiny bottles of essences, oils and liquors – just the right size for your baking experiments. Mayumi-sensei said that we could change up the flavours of the swiss roll as we liked and we could use flavoured essences or liquors, so these are conveniently placed. The tea Mayumi-sensei served us was from The Providore’s own tea range, Tea We Adore 12 Ceylon . It was refreshing tea with a citrus-y note that did not leave a dry aftertaste. The Tea We Adore range has about 15 different flavours, from the Classic Earl Grey and English Breakfast to more flavourful mixes such as Oolong Milk Tea, Assam Margherita and Darjeeling Makaibori. After your class, you’ll be given a 10% off all retail purchases made that day, which is a good chance to stock up while you’re there. The Providore Cooking Studio has a wide range of classes that appeal to aspiring chefs of various skill levels. From the beginners simple Eton Mess to the more complex macaron towers. Classes start at $120, last for about 2 hours and you get to take back one full sized baked goodie at the end of it (while you get to observe the making of another). For more exciting adventures, interesting places to go, good foods to eat, follow us on Instagram, like us on Facebook or read an issue of our magazine.